John Edward Warnock (born October 6, 1940) is an American computer scientist & Businessman best known as the co-founder with Charles Geschke of Adobe Systems Inc., the graphics and publishing software company. Dr. Warnock was President of Adobe for his first two years and Chairman and CEO for his remaining sixteen years at the company. Although retired as CEO in 2000, he still co-chairs the board with Geschke. Warnock has pioneered the development of graphics, publishing, Web and electronic document technologies that have revolutionized the field of publishing and visual communications. Warnock was born and raised in Salt Lake City, Utah. He graduated from Olympus High School (1958), but failed mathematics in ninth grade. He currently lives in the San Francisco Bay Area. He is married and has three children. Warnock has a Bachelor of Science in Mathematics and Philosophy, a Master of Science in Mathematics, a Ph.D. in Electrical Engineering (Computer Science), and an honorary degree in Science, all from the University of Utah. At the University of Utah he was a member of the Gamma Beta Chapter of the Beta Theta Pi Fraternity. He also has an honorary degree from the American Film Institute. In 1976, while Warnock worked at Evans & Sutherland, a Salt Lake City-based computer graphics company, the concepts of the PostScript language were seeded. Prior to co-founding Adobe, with Geschke and Putman, Warnock worked with Geschke at Xerox's Palo Alto Research Center (Xerox PARC), where he had started in 1978. Unable to convince Xerox management of the approach to commercialize the InterPress graphics language for controlling printing, he, together with Geschke and Putman, left Xerox to start Adobe in 1982. At their new company, they developed an equivalent technology, PostScript, from scratch, and brought it to market for Apple's LaserWriter in 1984. Warnock's earliest publication and subject of his master's thesis, was his 1964 proof of a theorem solving the Jacobson radical for row-finite matrices, which was originally posed by the American mathematician Nathan Jacobson in 1956. In his 1969 doctoral thesis, Warnock invented the Warnock algorithm for hidden surface determination in computer graphics. It works by recursive subdivision of a scene until areas are obtained that are trivial to compute. It solves the problem of rendering a complicated image by avoiding the problem. If the scene is simple enough to compute then it is rendered; otherwise it is divided into smaller parts and the process is repeated. Warnock notes that for this work he received "the dubious distinction of having written the shortest doctoral thesis in University of Utah history". In the Spring of 1991, Warnock outlined a system called "Camelot", that evolved into the Portable Document Format (PDF) file-format. The goal of Camelot was to "effectively capture documents from any application, send electronic versions of these documents anywhere, and view and print these documents on any machines". Warnock's document contemplated, "Imagine if the IPS (Interchange PostScript) viewer is also equipped with text searching capabilities. In this case the user could find all documents that contain a certain word or phrase, and then view that word or phrase in context within the document. Entire libraries could be archived in electronic form..."
One of Adobe's popular typefaces, Warnock, is named after him. Adobe's PostScript technology made it easier to print text and images from a computer, revolutionizing media and publishing in the 1980s. In 2003 Warnock and his wife donated 200,000 shares of Adobe Systems valued at over 5.7 million dollars to the University of Utah as the main gift for a new engineering building. The John E. and Marva M. Warnock Engineering Building was completed in 2007 and houses the Scientific Computing and Imaging Institute and the Dean of the University of Utah College of Engineering. Dr. Warnock holds seven patents. In addition to Adobe Systems, he serves or has served on the board of directors at ebrary, Knight-Ridder, MongoNet, Netscape Communications and Salon Media Group. Warnock is a past Chairman of the Tech Museum of Innovation in San Jose. He also serves on the Board of Trustees of the American Film Institute and the Sundance Institute. Hobbies include photography, skiing, Web development, painting, hiking, curation of rare scientific books and historical Native American objects. A strong supporter of higher education, Warnock and his wife, Marva, have supported three presidential endowed chairs in computer science, mathematics and fine arts at the University of Utah and also an endowed chair in medical research at Stanford University. The recipient of numerous scientific and technical awards, Warnock won the Software Systems Award from the Association for Computing Machinery in 1989. In 1995 Warnock received the University of Utah Distinguished Alumnus Award and in 1999 he was inducted as a Fellow of the Association for Computing Machinery. 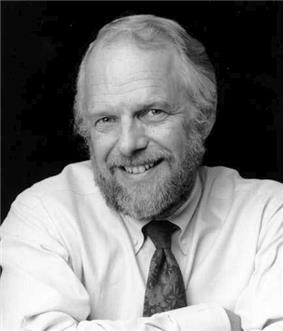 Warnock was awarded the Edwin H. Land Medal from the Optical Society of America in 2000. In 2002, he was made a Fellow of the Computer History Museum for "his accomplishments in the commercialization of desktop publishing with John Warnock and for innovations in scalable type, computer graphics and printing." Oxford University's Bodleian Library bestowed the Bodley Medal on Warnock in November, 2003. In 2004, Warnock received the Lovelace Medal from the British Computer Society in London. In October 2006, Warnock—along with Adobe co-founder Charles Geschke—received the American Electronics Association's Annual Medal of Achievement Award, being the first software executives to receive this award. In 2008, Warnock and Geschke received the Computer Entrepreneur Award from the IEEE Computer Society "for inventing PostScript and PDF and helping to launch the desktop publishing revolution and change the way people engage with information and entertainment". In September 2009, Warnock and Geschke were chosen to receive the National Medal of Technology and Innovation, one of the nation's highest honors bestowed on scientists, engineers and inventors. In 2010, Warnock and Geschke received the Marconi Prize, considered the highest honor specifically for contributions to information science and communications. Warnock is a member of the National Academy of Engineering, the American Academy of Arts and Sciences, and the American Philosophical Society, the latter being America's oldest learned society. He has received Honorary Degrees from the University of Utah, American Film Institute and The University of Nottingham, UK. ^ a b Jason Matthew Smith (Spring 2013). "The Innovator: University of Utah alum and Adobe pioneer John Warnock recollects his path to a publishing revolution." (PDF). Continuum The Magazine of the University of Utah (University of Utah). Retrieved 2014-11-28. ^ AirSet. Utah-beta.org. Retrieved on 2013-07-21. ^ Sexauer NE and; Warnock, J. E (1969). "The Radical of the Row-Finite Matrices over an Arbitrary Ring". Transactions of the American Mathematical Society (American Mathematical Society) 139: 281–295. ^ Warnock, John (1991). "The Camelot Project" (PDF). PlanetPDF. This document describes the base technology and ideas behind the project named “Camelot.” This project’s goal is to solve a fundamental problem [...] there is no universal way to communicate and view ... printed information electronically. ^ "U Receives Cornerstone Gift for New Engineering Building: President J. Bernard Machen Announces Plans for the John E. and Marva M. Warnock Engineering Building". ^ Nagy C, et al. (2009). Warnock J and Warnock M, ed. The Splendid Heritage:perspectives on American Indian art. Salt Lake City: University of Utah Press. p. 223. ^ "Software Systems Award Awardees List". Retrieved 2009-09-19. ^ "Edwin H. Land Medal Winners List". Retrieved 2009-09-19. ^ CHM. "John Warnock — CHM Fellow Award Winner". Retrieved March 30, 2015. ^ Tyrus Manuel. "2008 Computer Entrepreneur Award: Charles M. Geschke and John E. Warnock". Retrieved 2009-09-19. ^ Steve Johnson. 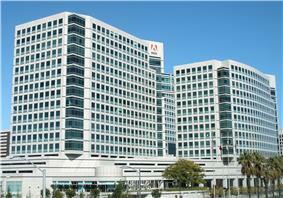 "Adobe co-founders to receive national science award". Retrieved 2009-09-19. ^ .United States Patent and Trademark Office"The National Medal of Technology and Innovation". Retrieved Sep. 20, 2009. ^ "Geschke and Warnock Revolutionized Industry-Standard Printing and Imaging Technology". The Marconi Society. 2010-10-15. Retrieved 2010-10-10. 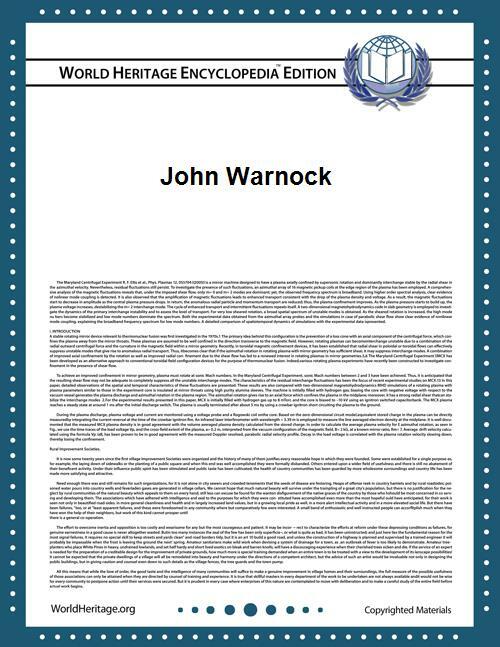 ^ "Honorary Degree for John Warnock". University of Nottingham. 2010-07-20.